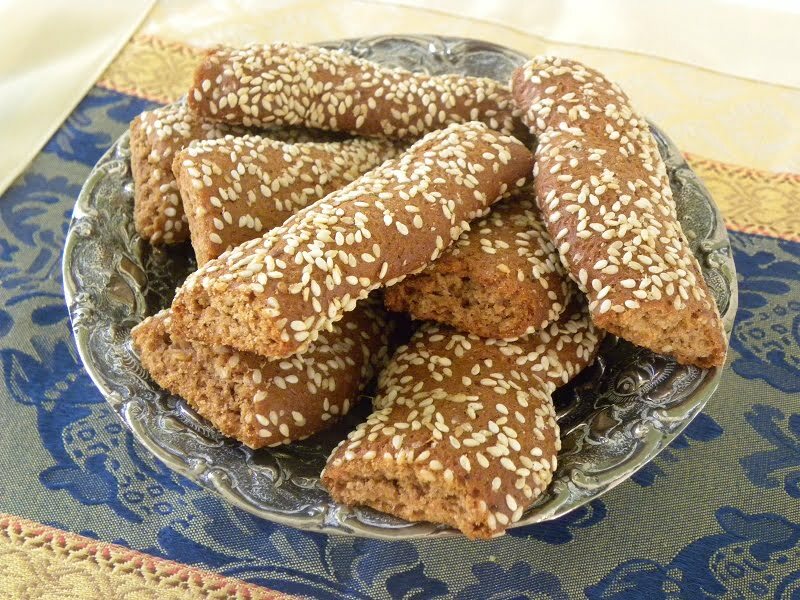 Moustokouloura (Moo-stoh_KOU_lou-rha) are Greek cookies made with Petimezi (peh-tee-MEH-zee), a concentrated syrup made of grape juice, which is used as a sweetener. “Moustokouloura“, from “moustos” (grape must) and “koulouria” (cookies), are perfect for breakfast, for a snack or with a cup of coffee. They are “nistisima – Lenten”, healthy, full of aroma but most of all delicious! If you want to make them vegan, just substitute honey with more petimezi or brown sugar. These were based on my previous recipe but I added honey, cocoa powder, to make them darker and red fortified Cypriot wine. Not just any wine but the famous Cypriot wine called Commandaria. For those who do not know, what petimezi or grape molasses is, it is a natural sweetener made from fresh grape juice. The juice is boiled until it is reduced to 10% or its original volume, until it becomes a concentrated “syrup”. I do not like the term “syrup” because it implies that it is made with sugar, whereas it 100% natural. So, in order to get 1 cup of petimezi, we need 10 cups of fresh grape juice. Petimezi is a very healthy sweetener because it strengthens the immune system and is rich in B vitamins. It is also rich in iron and calciumin and boosts energy. It has a complex sweet taste, with hints of caramel but also some hints of sourness. Disclaimer: The above is not medical advice but just for your information. Petimezi (grape molasses) is a natural sweetener made from fresh grape juice. Moustokouloura, pronounced Moo-stoh_KOU_lou-ra, are Greek cookies made with either fresh grape juice or petimezi, which is concentrated grape syrup. Palouzes, in Cypriot dialect or Moustalevria, is a pudding made with either fresh grape juice during autumn or with concentrated grape juice (petimezi or epsima, in Cypriot) when no fresh juice is available. Palouzes or Moustalevria, is a pudding made with either fresh grape juice during autumn or with concentrated grape juice when no fresh juice is available. The addition of Commandaria wine and cocoa powder, is my twist to the traditional recipe. Commandaria is known since antiquity and from the Cypriot viniculture the Portuguese produced Madeira and Port. A similar Greek wine is Mavrodaphne or Vin Santo, produced in Santorini. You can also substiitute Commandaria with Italian Marsala or the Hungarians Tokay. To make these Greek cookies, just make a long cord around 20 cm (8”) and then join the cord to make them round. You can also make them in other simple shapes, such as coils, “S” shape or the cord is folded in the middle and then just twisted twice (see my Easter cookies). The simplest form is to make them into thick cords and then cut them into pieces. Moustokouloura are delicious Greek cookies made with grape must or concentrated grape syrup, called petimezi in Greek. In a large bowl add olive oil, petimezi, brandy, Commandaria, orange zest and honey and mix with a balloon whisk. Dissolve the baking soda in the orange juice (attention as it will bubble) and add it to the other wet ingredients. Sift the flour with baking powder, cocoa powder and spices and mix in the salt. Add the flour mixture gradually and mix with your hand until the dough is not sticky on in the bowl or your fingers. (You can do this in your stand mixer using the hook). Line a baking tin with parchment paper and preheat oven to 180o C / 350o F.
Divide the dough into pieces of 50 - 55 grams (1.7 – 1.9 oz) maximum. Shape as you like and place in the tin, spaced apart. The first batch of 13 cookies was shaped into cords 3 cm (1.2”) diametre, rolled into sesame seeds, and were cut around 10 cm (4”) long. These were baked for 17 minutes. The remaining 13 were also shaped as above but were cut in the middle to make 24 smaller ones. These were baked for 15 minutes. The cookies may seem soft but they will firm up as they cool. If you do not want to add the cocoa powder, substitute that amount with flour.